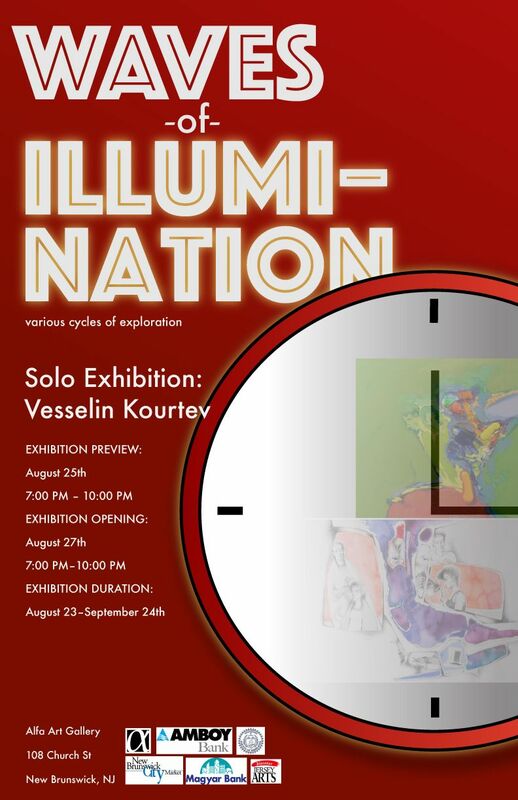 Alfa Art Gallery invites you to “Waves of Illumination: Vesselin Kourtev’s Solo Exhibition” featuring representative works from the artist’s various cycles of exploration in oil, watercolor, drawing, and mixed media. We are pleased to invite you to a solo exhibition of the gallery’s founder and professional artist, Vesselin Kourtev. The opening will be held on August 27th, 2016 at 7:00pm located on 108 Church Street, New Brunswick, NJ. All are welcome to explore a retrospective glimpse into Kourtev’s evolving, unique style of painting over his 20-year career. The pieces chosen offer snapshots into different cycles of Kourtev’s work and highlight original stylistic explorations, while displaying his mastery of multiple mediums. Vesselin Kourtev has over 20 years of experience as a professional fine artist. Born and raised in Bulgaria, Vesselin Kourtev received a high school degree in Fine Art from the Fine Arts School in the historic city Kazanluk, as well as his MFA degree from The Faculty of Fine Arts at the University of Veliko Turnovo, the capital of the Second Bulgarian Empire. From 1989 until 2002, Vesselin worked for the National School of Stage and Film Design in Plovdiv, Bulgaria. In the years following, he remained active within the Bulgarian art community and participated in a large number of national and international exhibitions and competitions. Vesselin and his wife, Galina, moved to New Jersey in 2002 and founded Alfa Art Gallery in 2007, which has held dozens of both solo and group exhibitions of local and international artists since its opening. He is now head Art Director and Resident artist at the gallery. In addition to working with the community to promote the gallery’s presence, Vesselin assists in laying out the design of the exhibitions. Vesselin’s work has been featured internationally in exhibits in Berlin, Antwerp, Geneva and Prague. Vesselin was featured in The Good Living Magazine from Saint Peter’s University Hospital, New Brunswick in 2008 and has exhibited his work in over a dozen shows across New Jersey and New York. Alfa will be displaying a range of Vesselin’s bodies of work throughout his career. His style is uniquely derived, varying in subject matter and style. Some works feature more delicately drawn figures and archetypal motifs with cultural references, whereas others focus on thick application of paint and an abstracted composition. Biblical Motif I is a piece representing a cycle exploring collage, primarily using a large piece of rose colored paper as a second material to work upon. 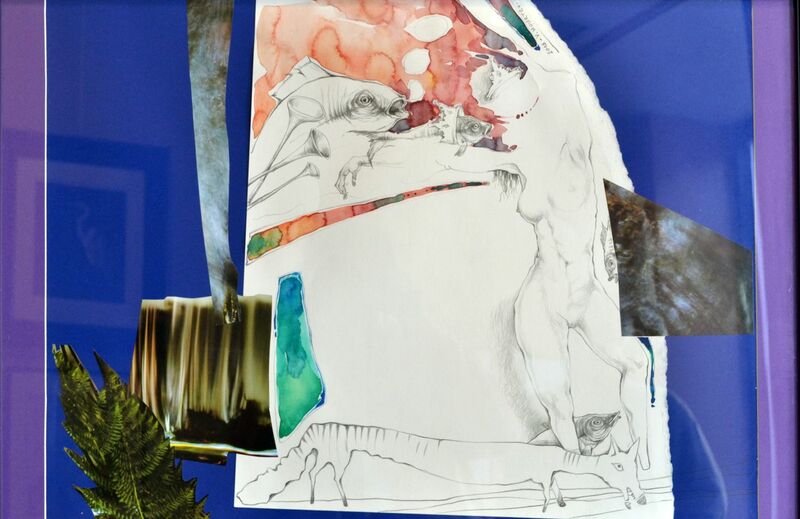 It unifies the piece and simultaneously acts as a barrier between the viewer and the figures (biblical references) beyond. Life’s Mission IV, another mixed media piece, incorporates strong, deep color and pattern along the outer sides, surrounding the center space with cosmic, natural imagery. Kourtev’s distinct delicate, mannerist drawing style is evident in the elongated treatment of the center female figure and the fish. Red Dots speaks to a new cycle of paintings where Kourtev transitions to larger canvases and focuses on the manipulation of paint. 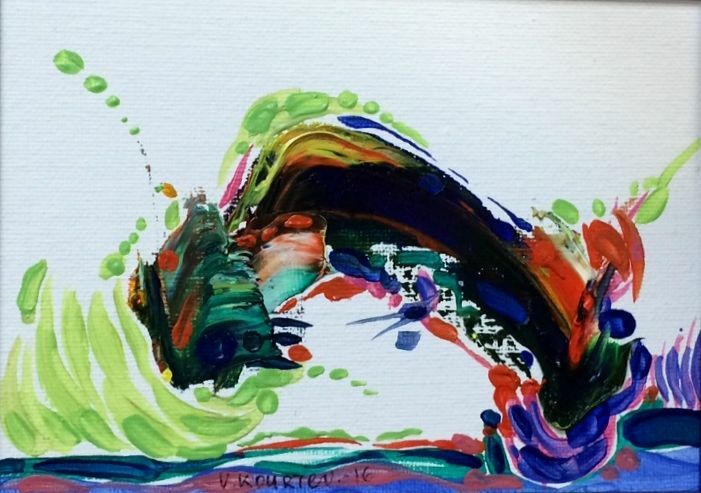 Kourtev’s painting technique allows for flatter swaths of paint, creating organic, abstract forms. Two red objects protrude from areas of red color, adding dimension to the work. He juxtaposes these brushstrokes with softer, more delicate details in areas where color overlaps, reflecting the softer strokes made in his drawings. 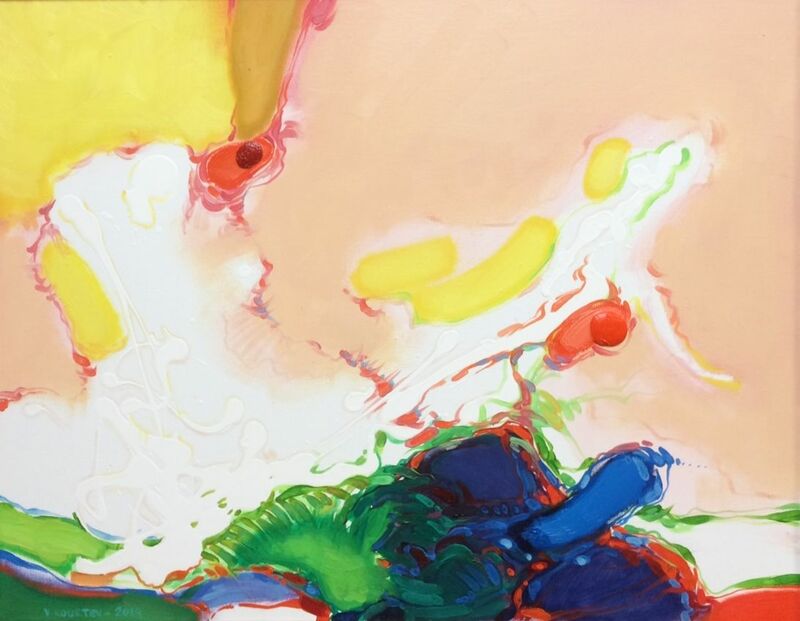 Colorful Dreams –1 is one piece in a series of smaller paintings stylistically similar to the series featuring Red Dots. This piece features striking, vivid color atop a white background, increasing the contrast. Kourtev tends to create dreamy references to landscapes and horizons at the bottoms of these images, where the painted forms erupt from the ground. In this painting, a wave-like form arches out from the lower right corner of the painting, and down toward the left. Small, light green brush strokes surrounding the edge of the form add a sense of movement and energy to the overall composition. Alfa Art Gallery is a non-profit organization determined to support emerging and well-established artists and to give their work exposure and critical following within the art community.